What year did you graduate from The University of Texas Health Science Center at San Antonio? I graduated from the Dental School in 1975. I was the first female dental student to graduate from the school by alphabetical order. There were two of us in my class. Dr. Birgit Glass was the other female that graduated in 1975, making us the first two female graduates for the Dental School. I completed a two-year pediatric dental residency in 1982 in the Dental School’s Department of Pediatric Dentistry. What was the most valuable lesson – inside or outside the classroom – you learned at the UT Health Science Center San Antonio? The most valuable lesson I learned was to always keep the patients’ best interest first and provide high-quality dental care to all those I treat. What inspired you to want to become a dentist? My inspiration to become a dentist probably started on my 8th birthday. I ask my parents if I could have an appointment with the dentist as most of my friends had already visited the dentist and I had not. I don’t know if this was a premonition of a future desire but I thought a dental check was important to my health and well-being. What do you remember most vividly about your time at the Dental School? During my undergraduate education, I remember our classes in the basic sciences were taken with medical students. This was difficult but extremely beneficial in developing a strong academic and competitive background that is essential throughout one’s professional career. Our dental school class was only 16 students, and we knew each other very well. The closeness of our class provided support and encouragement during good times and bad. During my postgraduate residency at the Dental School, I remember working closely with my fellow residents. We would challenge each other to gain as much knowledge and experience from every situation we were confronted with. This environment of “competition” enabled all of us to excel didactically as well as clinically. Our access to patient care through the outside clinics and our general anesthesia rotation was second to none. What was your most rewarding experience at the Dental School? The most rewarding experience during my education was my rotation at the Robert B. Green Oral Surgery Clinic. I was able to treat multiple patients who were in severe pain and made them comfortable and happy by relieving their dental pain. Each patient seemed truly grateful for the services provided. My professional faculty in my residency had such a wealth of experience and knowledge that allowed me to gain a tremendous understanding of the various treatment options for my patients. My greatest professional achievement has been the ability to practice dentistry for 40+ years and enjoy what I am doing. Working with children since 1982 has allowed me to treat children who are suffering from dental disease and put a smile on their face and receive a big and loving hug. 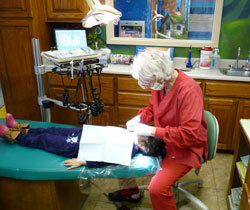 Helping children with their dental problems gives one such a feeling of self-gratification and happiness. I am currently a practicing pediatric dentist in the San Antonio, Texas. A day on the job is always a gift as I treat children of all ages as well as many with disabilities. Being able to relate and take care of these patients makes each day rewarding and blessed. I go to work each day excited and happy that I am a pediatric dentist and taking care of children. My advice for current students is to always put the needs of the patient first and your life will be fulfilled as a dental professional. Start small and earn the right to move up. I give back to the University because dentistry and my profession have given me many opportunities and blessings throughout my professional career. Donating to our profession allows ones’ legacy to live on and help promote dental education now and in the future. Giving back to your dental school helps pay back what your dental school education has given you. Without my dental education I could have never received the multiple blessing and opportunities life has given me and my family. What is your anticipated graduation date from The University of Texas Health Science Center at San Antonio? As a student, which specialty interests you most? In college, I volunteered at a dental clinic that provided free dental care in Arlington, Texas. I worked with many different dentists who all volunteered their time and expertise to help people who otherwise would not have received dental care. The different dentists that I volunteered with inspired me to pursue a career in which I could give back to an underserved community. What has been the most valuable lesson – inside or outside the classroom – you have learned at the UT Health Science Center San Antonio? The most valuable lesson that I have learned is to not be shy about approaching faculty and new opportunities. My experience has far exceeded my expectations because of the knowledge my faculty have shared with me outside of the classroom and the many experiences being a student at the School of Dentistry has provided me. What has been your most rewarding experience at the UT Health Science Center San Antonio thus far? My most rewarding experience has been all of the different teaching projects I have been involved in during my last four years. I discovered the joy of teaching through these experiences and it has help me determine what I would like to do for the rest of my career. I would advise all students to seek out experiences outside of the classroom. My service, research, professional and social experiences outside of the classroom have been key to my enjoyment in dental school. I plan to return to the dental school as faculty after I finish my specialty training to teach and mentor students the way my faculty have done for me.